The Story of the Jesus Heart Chip! 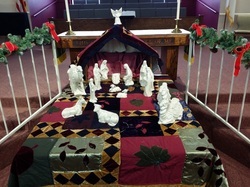 One year the Nativity Scene (left photo) was being taken down when the Angel on top was accidentally jostled and fell on the Baby Jesus sculpture. This resulted in the heart-shaped chip shown in close-up photo at right!